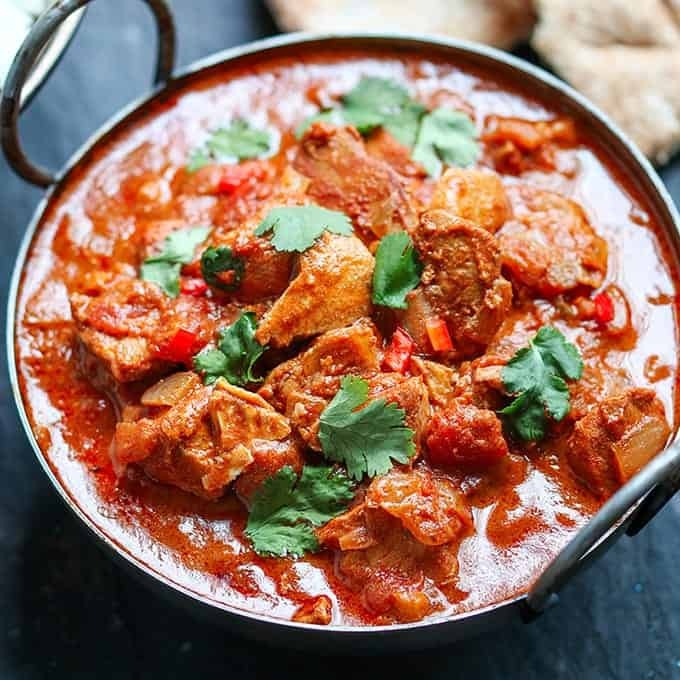 My Slow-Cooked Lamb Massaman Curry is a creamy curry with tender chunks of lamb and potato. The homemade Massaman paste comes together in 5 minutes. Slow-Cooked Lamb Massaman Curry. Ahhh just the title makes my mouth water. 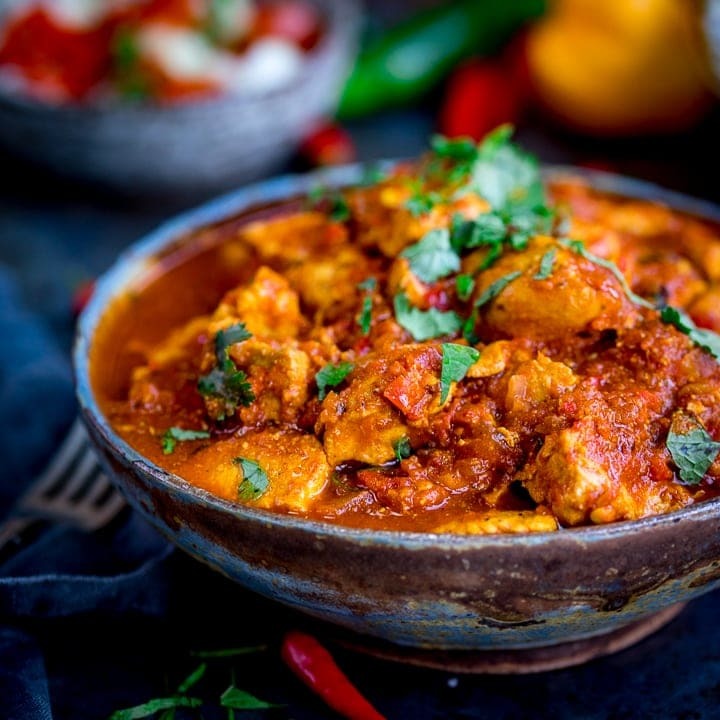 Just home from 5 days of sight-seeing in London, it was a toss-up whether I was looking forward to being back in my own bed, being welcomed home by our two cats, or making and eating this curry. Sorry cats, I did miss you, but the curry wins. What a week in London! We had so much fun! Gracey has been learning about the Great Fire of London at school and has wanted to go since then. Chris and I have only ever been there on business so we were looking forward to the eating, shopping and the famous sites. We must have covered 8 miles a day and there was so much to see during all that walking that I barely heard a moan from my five-year old (I don’t think we were ever going to manage a completely moan-free trek of that distance). If you haven’t been, then I totally recommend it! Chinatown – They were preparing for Chinese New Year whilst we were there. It was so hard choosing which one of the 80 Chinese restaurants to eat in! Oh, and I also got to spend half a day on a knife skills course at the brilliant Leith’s school of food and wine. I loved every minute of it, ok maybe not the bit where I was scooping out fish guts from my seabass, but otherwise it was great! Coming back to the curry now. I won’t go on too much further except to say this is a really good freezer recipe, and the homemade Massaman sauce comes together very quickly. 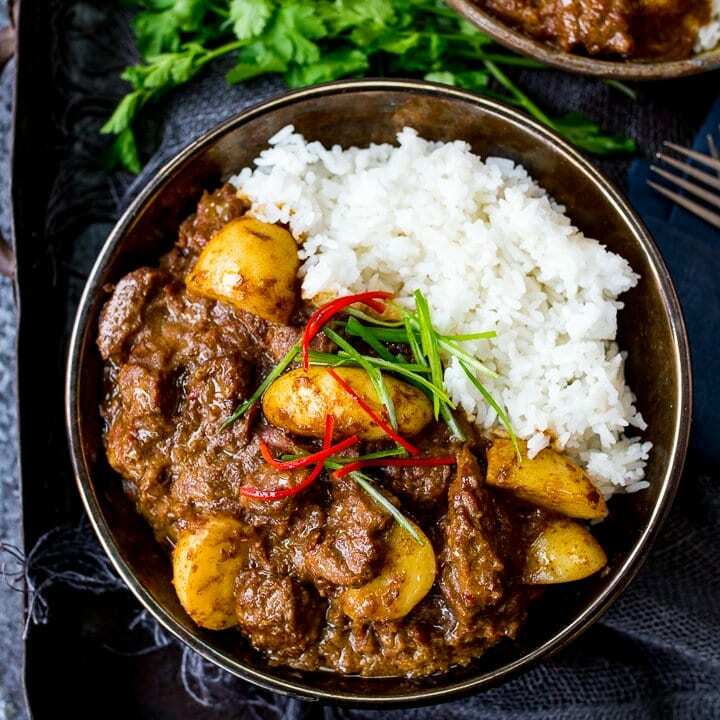 My Slow-Cooked Lamb Massaman Curry is based on my Beef Massaman curry recipe, and works perfectly to get that fall-apart meat along with potatoes that are full of flavour from being cooked in the sauce. I use chillies in my recipe, but you can leave them out if you have anyone who doesn’t like it too spicy. If I’m making this for the whole family, I tend to leave the chillies out, then dish up the children’s portion first. Then I’ll add chopped chillies and cook them for a couple of minutes in the sauce before serving up to the adults. It doesn’t give quite the same depth of chilli heat, but is a good compromise. 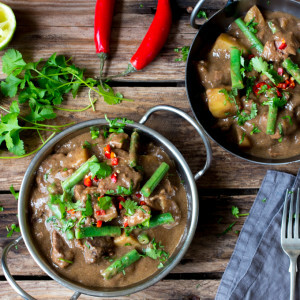 Slow Cooked Lamb Massaman Curry - tender lamb and potatoes with coconut milk and an easy homemade massaman sauce. Heat the oil in a large pan. Toss the chopped lamb in the cornflour, salt and pepper. Fry the meat in the oil for about 5 mins on medium to high heat. You can do this in batches, but I’m a bit too lazy for that. I find that if you put the meat in, and leave it alone for a few minutes before you stir it, you’ll get a nice dark colour on the lamb. The lamb will probably stick a bit to the pan, so you might need to give it a little scrape with a spatula. Once the lamb has cooked for 5 mins, turn down the heat a little and add in the curry paste. Give it a stir to coat the lamb and let it cook for a couple of minutes. Then add in the beef/chicken/lamb stock and coconut milk. Give everything a stir (make sure you give any bits stuck at the bottom of the pan a scrape), place the lid on and gently simmer on a low heat for 1 hour 45 mins (alternatively you can place in the oven at about 160c/320f). Give it a stir every so often. If it’s starting to look dry you can add in some more stock or water. After the 1 hour 45 mins, add in the potatoes, give it a stir and cook for a further 25 mins until the potatoes are tender (this is a good time to start cooking your rice too). After the potatoes have cooked for 25 minutes, add in the green beans. Stir and cook for 5 minutes, then turn off the heat (or take out of the oven) and mix in the lime juice. Serve the curry on a bed of rice with a sprinkling of coriander/cilantro, fresh chillies and a wedge of lime. Any leftovers can be cooled, covered and frozen. Defrost thoroughly and reheat until piping hot in the microwave or in a pan. Nutritional Information is per serving, without boiled rice. 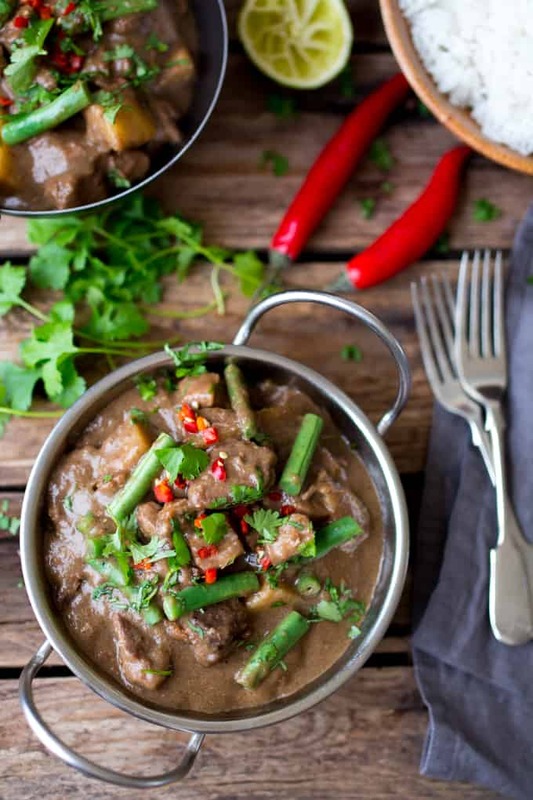 Love your beef massaman curry, trying this at the weekend, can’t wait looking forward to this already. I absolutely love lamb and this looks crazy good. Pinned! Wasn’t Harrods a trip?? I felt like I was at the Disney World of Department Stores 🙂 This curry looks amazing! Will be trying is soon, and pinning it now. Thanks for pinning Caroline. Yes I LOVED Harrods. I could have spent the day there!! I managed to get a couple of hours there with Chris and the kids, but definitely not long enough!! I love massaman curry but never would have thought to make it myself before. You definitely have motivated me to do so now after seeing your slow cooked version Nicky! Thanks Thalia, it’s wonderful, you should definitely try it. I bet you’d do some fab photos if you did. Love your photography!!! 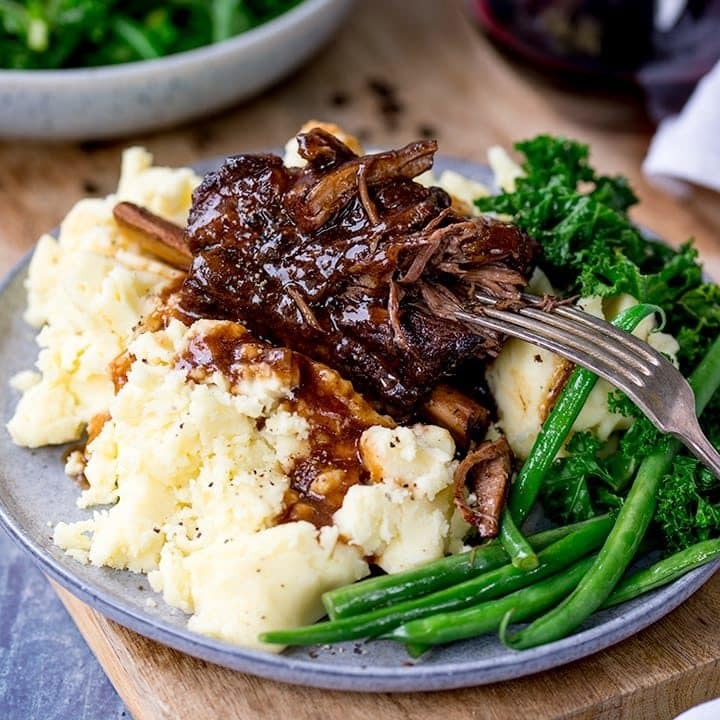 I live in the US, what is the equivalent of casserole lamb? I’m not familiar with that cut. Thanks! 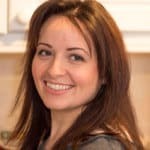 Hi, Really any boneless cut of lamb with a bit of fat running through should be fine – so I would say chump steak or loin chops or diced shoulder or leg.